Post Tagged with: "NYC Marathon"
Join the staff of Pavement Pieces on the 2018 New York City Marathon course. She completed the event with the closest time to exactly 10 hours, coming in at 10:00:12. The runners came in waves and one woman stopped in front of the two friends to catch her breath. By Natasha Abellard In Park Slope, Brooklyn supporters express admiration for 2015 marathon runners and their causes. Though traditionally a quieter part of New York City, those exiting the 3rd Avenue – 138 Street subway station were met with the sound of live jazz and cheering as loud as the bright green uniforms worn by volunteers passing out water and bananas to runners. Park rangers and police officers were turning away people with without identification bands. In addition to Van Briesen Park, Fort Wadsworth itself was accessible only to runners, police officers, and park rangers. “New York is the crème de la crème of the marathons, I’ve always loved coming up here,” said Dale-Pierce proudly beaming. 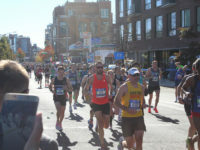 As a symbol of support, the Boston Marathon’s yellow line ran alongside the familiar blue line that guides runners along their trek in New York.